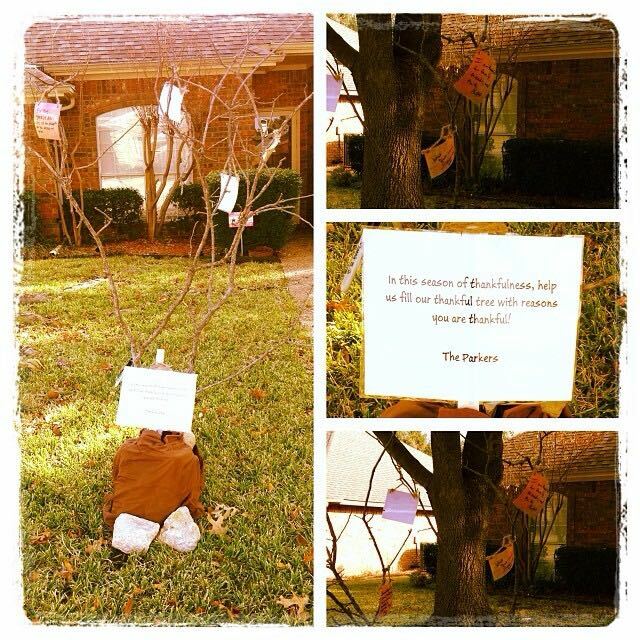 Three years ago my dear friend Stacy and her sweet little family started a Thankful Tree in their neighborhood. 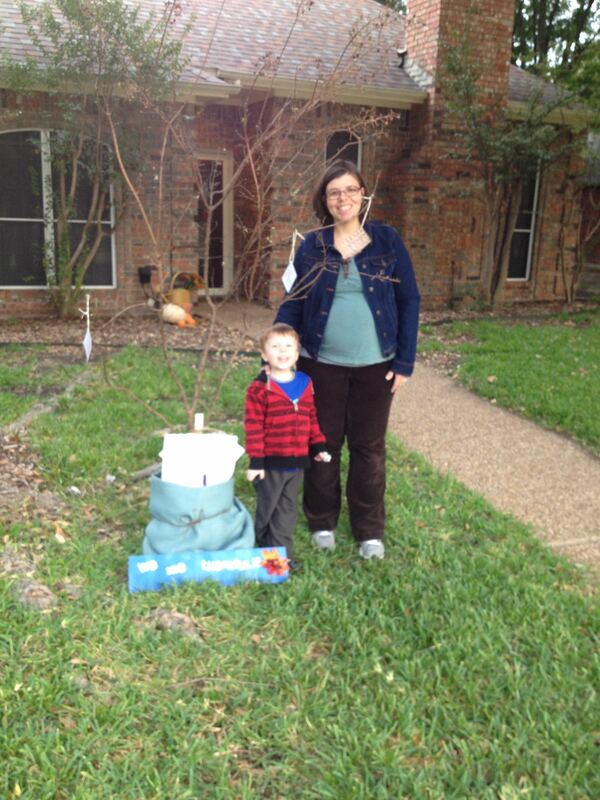 I thought this was the neatest idea and last year, with some helpful tips from her and the enthusiastic support of my husband, we decided to do one in our neighborhood. Our first year was a little rough. 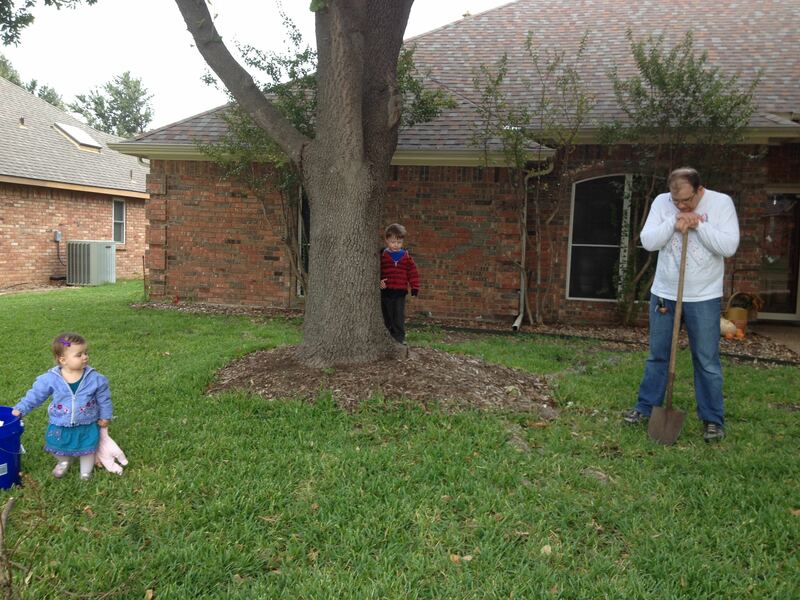 Between icky weather, last minute planning and sick kids, we got a pretty late start in putting our tree out. I think we had everything in place maybe 10 days before Thanksgiving. 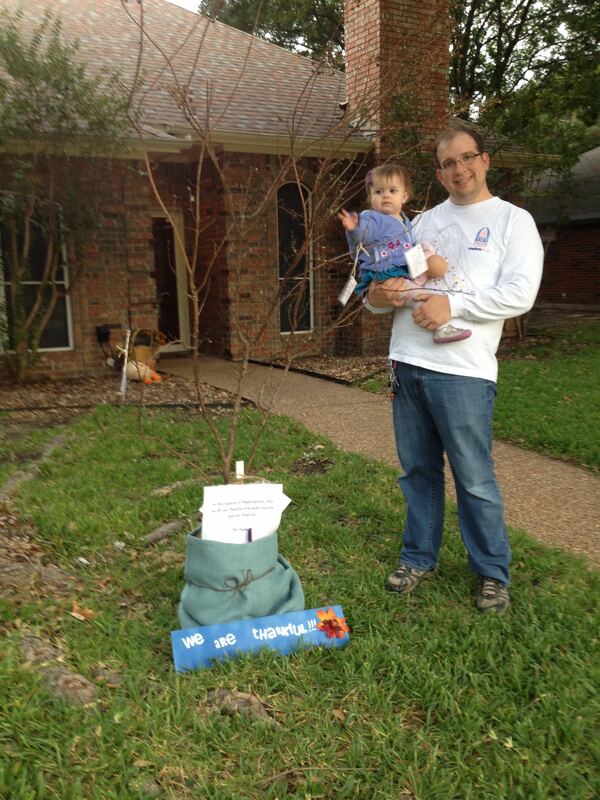 Even with short notice and a Charlie Brown looking thankful tree, we still had a few neighbors who participated and enthusiastically applauded our efforts. This year, armed with a little more experience and determination, we began talking about our tree in September and starting gathering supplies in early October. 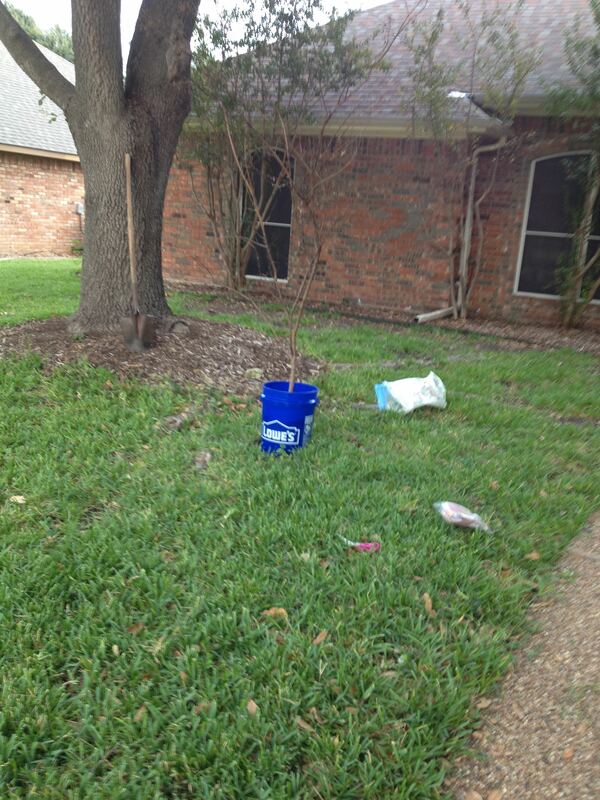 Below is a pic of our last day with the tree up! We had a little under 20 Thankful Cards!! We did quite a few of our own but several families participated and it was just a thrill to walk by every few days and see a new card on our tree! Last day with the tree up! 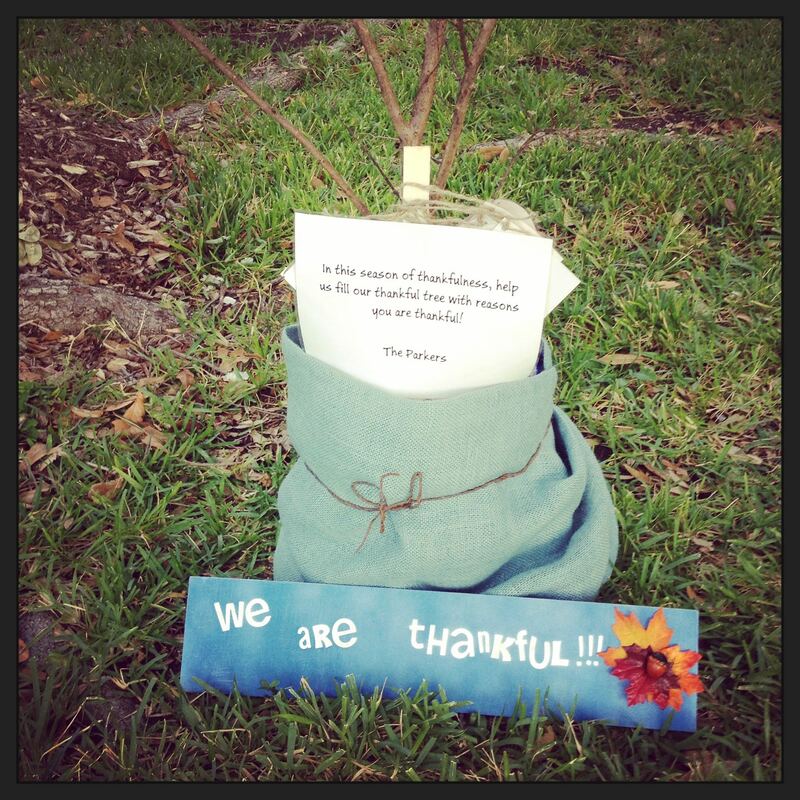 I’d love to share with you what we did to prepare this year for our Thankful Tree. 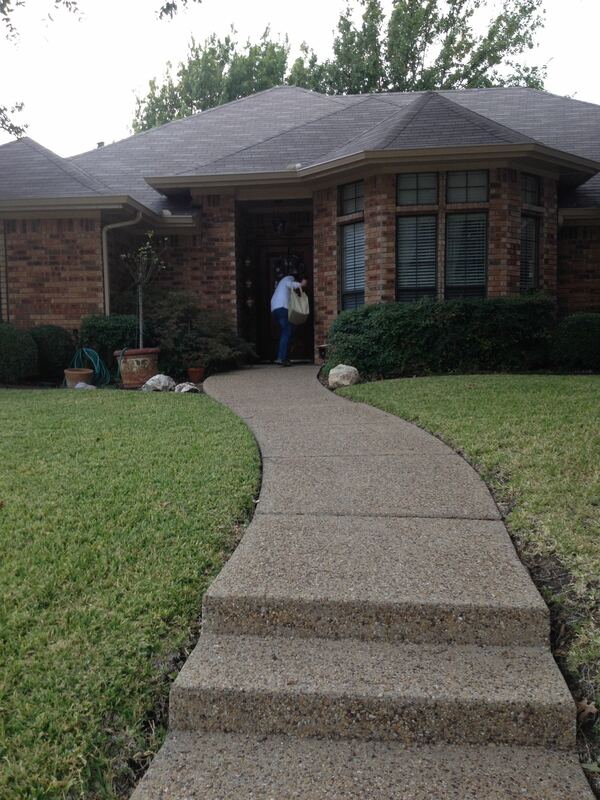 I know that there were at least 2 standing in the Plano area. I hope this will spread to other neighborhoods where I live and elsewhere. I challenge you to read what we did and consider doing something similar in your neighborhood next year! First I made a sign. I took foam letter stickers and placed them on a spare board of plywood leftover from another project. Then I took some blue spray paint and went to town. Once it dried I peeled off the stickers and the words remained (thankfully!) I took my glue gun and attached a few fake leaves and an acorn and ta dah..we had a sign. (One thing I learned is that I should have sealed/treated the wood. It started warping after the first rain. It still looked good after a month of manic weather but I doubt it will be around for years and years of Thankful Trees). Although our neighborhood does not have a HOA we do have a Neighborhood Watch as well as a nifty Social Community where you can do everything from sell a bookshelf to ask for a referral for a plumber by posting on their site. 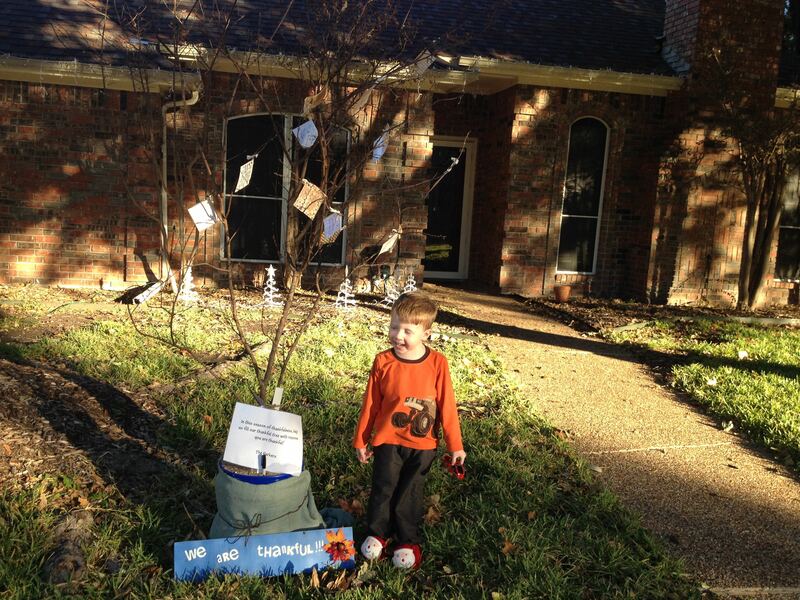 Last year we sent out an email explaining our tree on the Social Site but that was it. 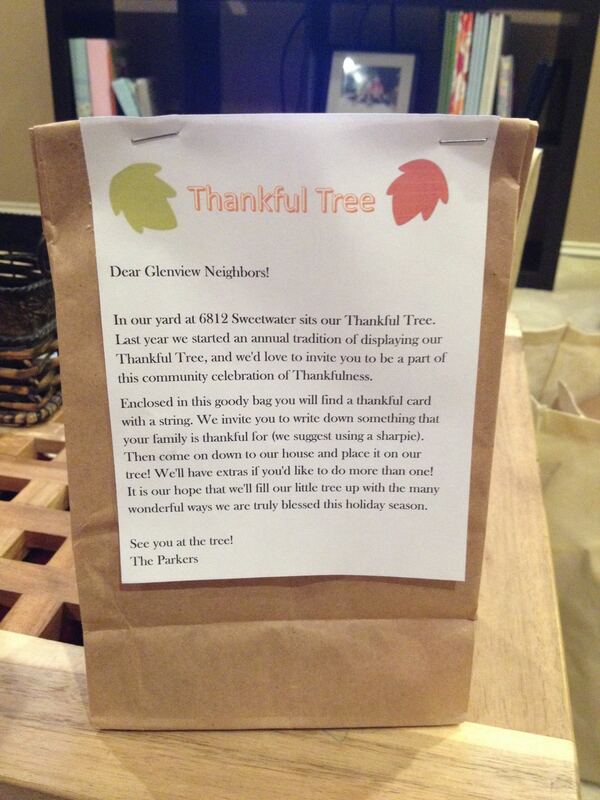 This year we decided to increase our efforts and made these thankful bags. We filled them with candy and a laminated thankful tag (more on that in a minute). 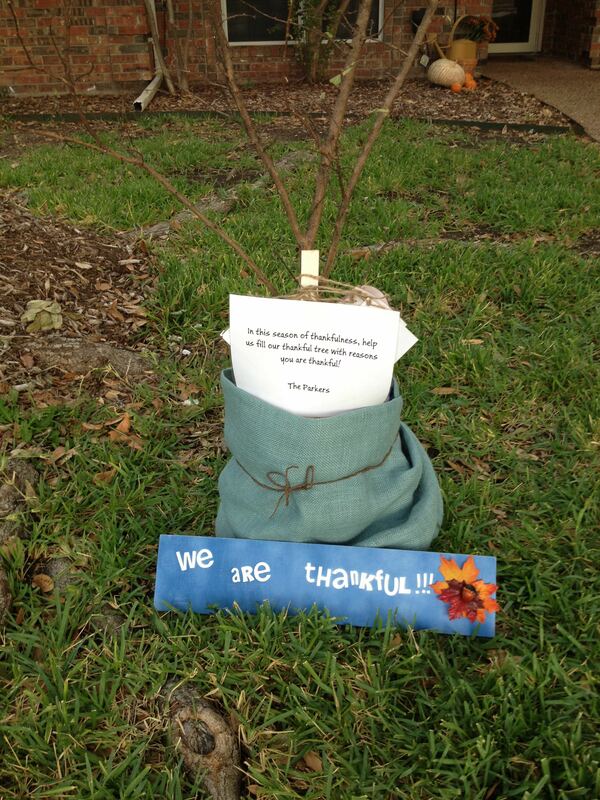 Then we attached a letter explaining our Thankful Tree and inviting them to add a note of thankfulness to our tree! We made 30 Thankful Bags! Then came the fun part. Putting up our Thankful Tree! 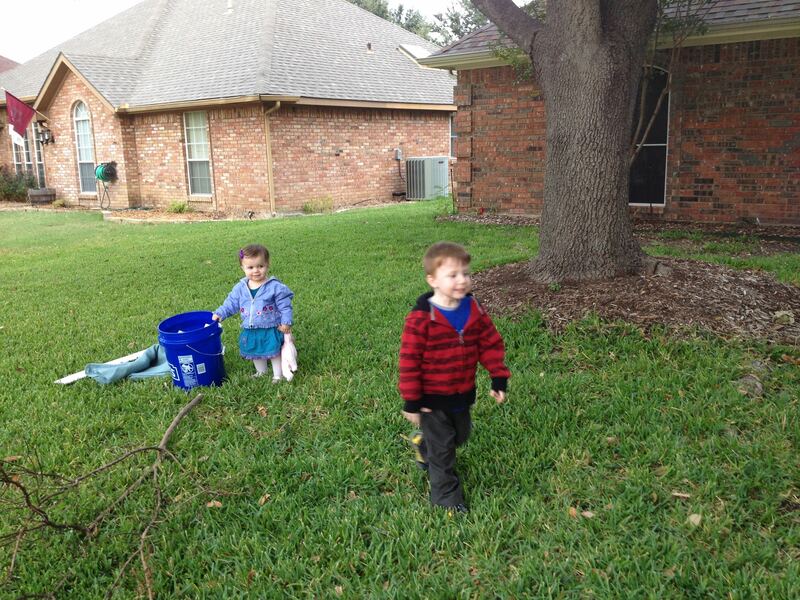 The kids were a great help this year. We learned from last year that level ground and the proper supplies are key in making sure our tree can survive the uncertainty of November’s weather. Last year our tree fell down a few times! Loaded with that knowledge, my husband identified a level area in our yard that still was close enough to the public sidewalk that neighbors would feel good about walking into our yard. 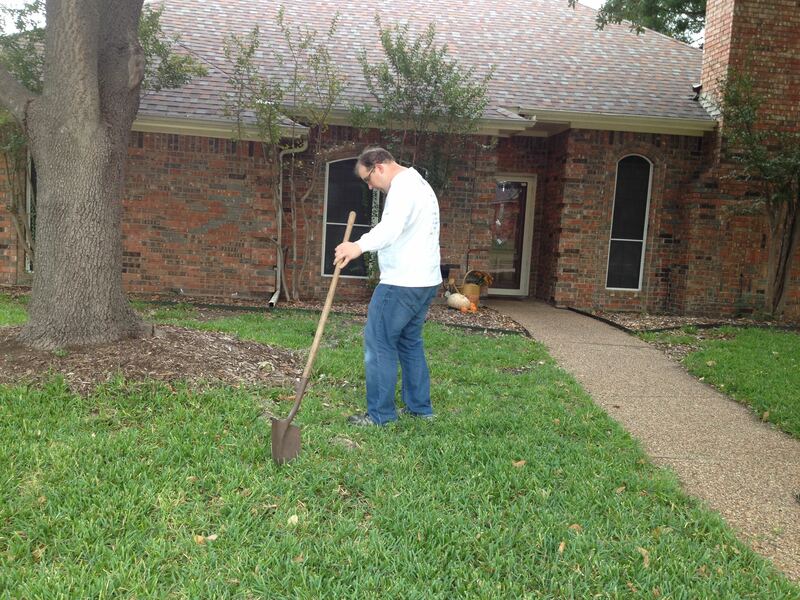 He then leveled the ground even more with his shovel. So thankful for a husband who not only supports my shenanigans but often times comes up with the idea himself. Basic supplies needed to make a thankful tree include a 5 gallon bucket, about 70 pounds of playground sand, and a tree branch. Total cost for these items was about $10. Not bad. I purchased some pretty burlap from Hobby Lobby last year with the tree in mind. I can’t remember how much it was but as frugal as I tend to be it couldn’t have been too much. 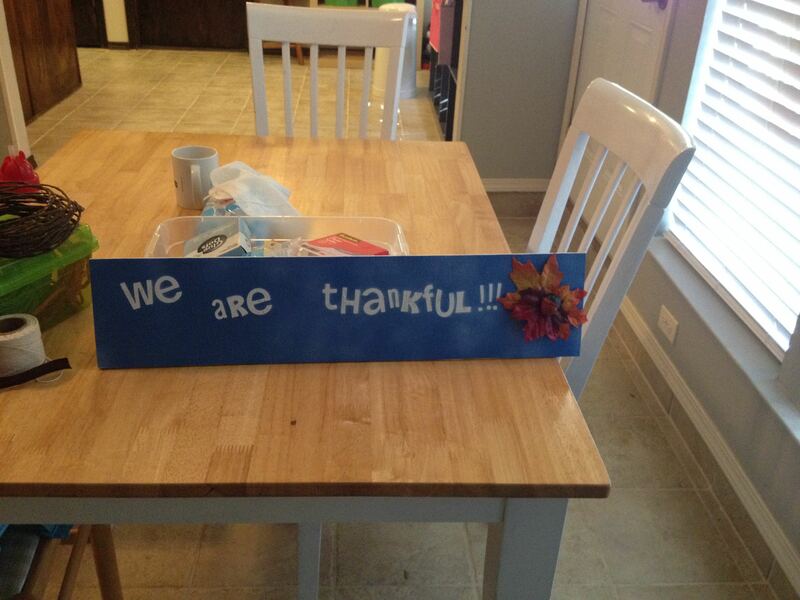 And I had twine and scrapbook paper for the actual Thankful Cards on hand. Laminating the cards was $1.50. I already had brown paper bags and the price for the candy was minimal. So a very inexpensive creation! Never miss a photo opp! And now back to those thankful bags and laminated cards. 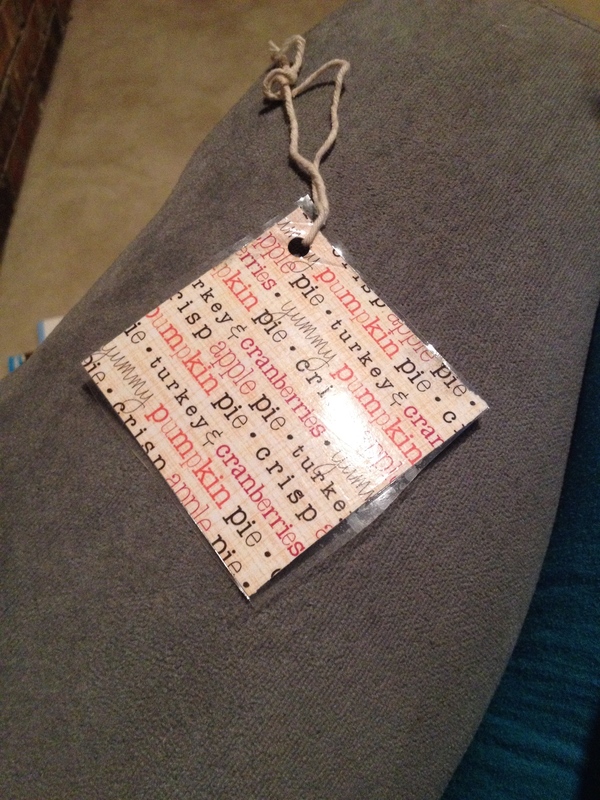 First the thankful tags. Thanks to the wisdom of Stacy, we learned that it was a wise idea to laminate the cards so they could handle the weather. 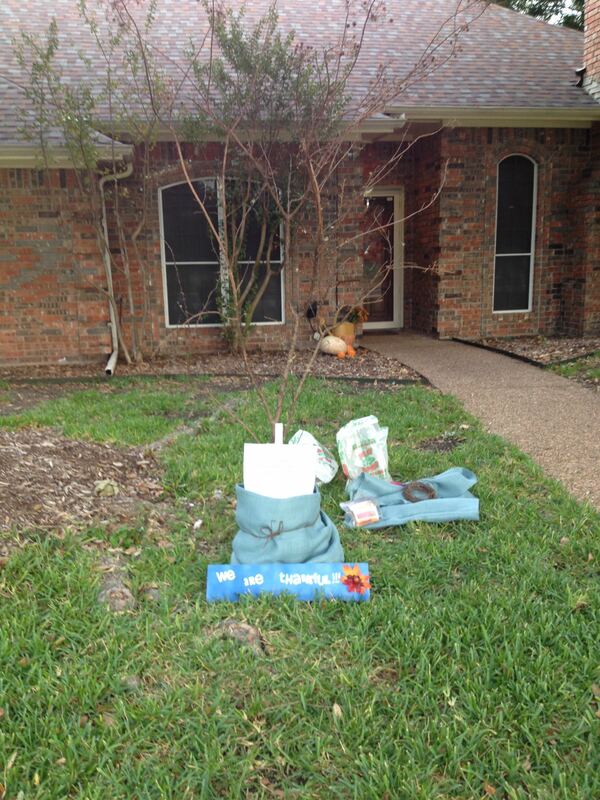 One night of rain and our paper thank you’s would have been ruined. So laminating them is a definite must unless you can keep your tree out of the elements or guarantee no snow or sleet or rain for the entire month of November. 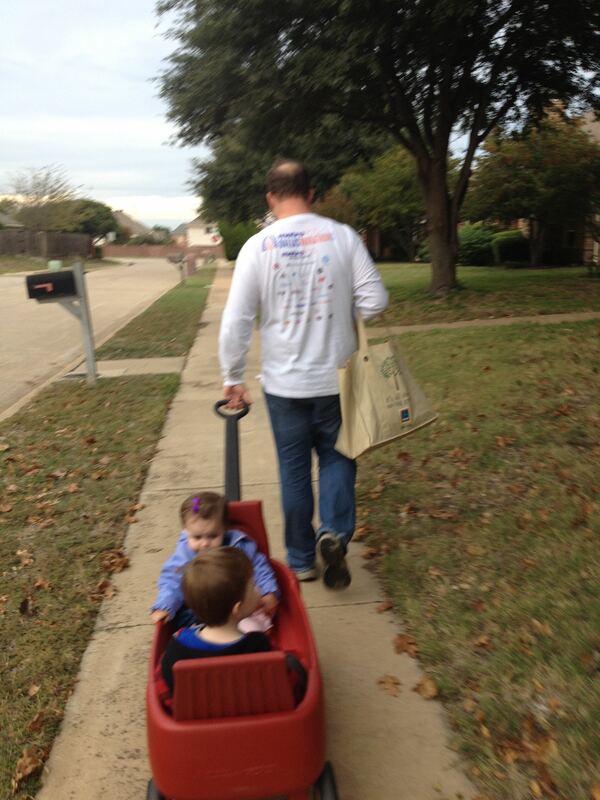 Armed with our goody bags, red wagon and children, we set off to deliver our Thankful Bags to 30 of our closest neighbors. Delivery day was the day AFTER Halloween which my son had participated in and fully understood for the first time this year so it was really neat to see the reverse concept taking place for him. Instead of knocking on doors and asking for something we were going up to our neighbors’ doors and leaving a gift for them. Our Thankful Tree was up for 30 days and during that time, we saw thankful notes for freedom, the ability to vote, for babies on the way and friendships. It was such a neat neat experience. We are hopeful that our community of thankful cards will continue and that this will spread to other neighborhoods in the years to come!